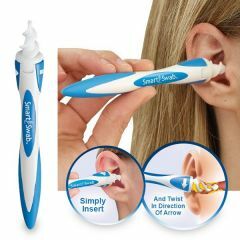 Clean your ears the smart way! Simply twist the Smart Swab handle and the soft, flexible tip with spiral grooves easily removes the earwax. Includes 16 tips and a storage case. Traditional cotton swabs can be dangerous to use when removing earwax. Push too far and the swab can cause pain or push wax deeper into your ear. Not the Smart Swab. It enters the ear at the perfect distance, allowing the spiral tip to gently latch onto the wax with a simple twist. Disposable tips are easy to discard. Simply press a button on the handle to throw away the used tip. Then, just snap the new tip from the storage case into place. Plastic.